Ceph is a distributed software-defined open-source file system without a single point of failure, which enables the infinite clusters’ scaling. These features make the system a perfect solution for not only workloads distribution but also data storing and replication. Furthermore, Ceph is reliable and provides data high availability. 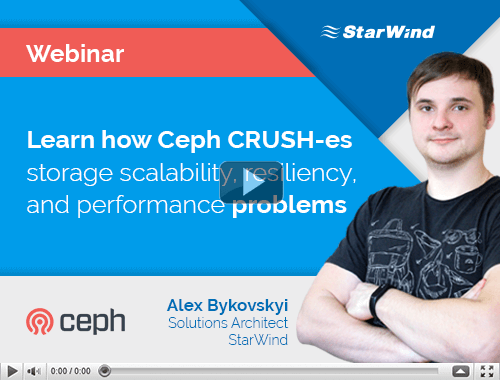 Due to all these benefits, Ceph has been utilized in our new StarWind Enterprise Storage Appliance. First, it is necessary to shed the light on the basic concept of the Software-Defined Storage (SDS). These storages are simple in management due to their automatization and use of standard interfaces. It should be also noted that these systems are capable of being operated without excessive employment of new hardware and software. SDS is also attractive because it gives users a room for scaling. For example, storages can be scaled easily to the exabyte level without having any additional software and hardware employed. Eventually, SDS is transparent for users, thus, they can easily monitor and manage their storage. Ceph is an outstanding example of an SDS. Its CRUSH algorithm liberates the storage from scalability and performance limitations that are imposed by the centralized data table mapping. Lastly, the described SDS is completely hardware-agnostic, hence, Ceph architecture can be built on any hardware. Ceph has a 3-layer architecture. The first level, RADOS, consists of self-managing storage nodes. These nodes ensure autonomous and reliable work of the system. The second layer, LIBRADOS, is a library that enables applications to access RADOS directly. LIBRADOS also provides the support for C, C++, Java, Python, Ruby, and PHP. Unlike applications, clients access RADOS via Ceph FS, a POSIX-compliant distributed file system that supports FUSE. There is also the third level in Ceph’s architecture which consists of RADOSWG and RBD. The former is compatible with S3- and Swift-based apps and the latter serves as hosts and VM connection. Regarding the advantages and potential of Ceph, we employed it for our new enterprise storage solution. The new product can be used for storing vast amounts of data due to its high performance and ability to be scaled massively. What is more, it utilizes ARM hardware operated through Ceph, delivering a lower latency.